Boom 11,3 m to 60,0 m seven section TWIN-LOCK™ boom. 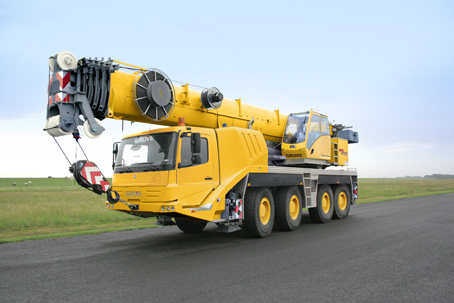 Maximum tip height 63,0 m.
Cab Aluminium, full vision, tiltable (approx. 20°), safety glass, adjustable operator's seat with suspension (optional), engine-independent heater. Armrestintegrated crane controls. Ergonomically arranged instrumentation and crane operating controls. Slewing 2 slewing gears with axial piston motors, planetary gears, automatic break. Counterweight 26,2 tonnes, consisting of various sections (21,6 t within 2,55 m vehicle width). Hydraulic removal system. Hydraulic system 2 separate circuits, 1 axial piston variable displacement pump with electronic power limiting control and 1 axial piston variable displacement pump for slewing. Thermostatically controlled oil cooler. Tank capacity: 550 l.
Hoist Axial piston motor with planetary gear and brake. Drum rotation indicator. IR - Hoist camera with light. Engine Mercedes Benz OM470LA, diesel, 6 cylinders, water cooled, turbocharged, 320 kW at 1700 rpm (80/1269 EWG fan loose). Max. torque: 2100 Nm at 1300 rpm. Fuel tank: 200 l + 200 l. Engine emission: Euromot 4 / EPA / CARB Tier 4 final (non road). Axle lines 4 axle lines, axle lines 1, 2, 3 and 4 steered, axle line 1, 3 and 4 driven. Suspension MEGATRAK®. All wheels with independent hydropneumatic suspension and hydraulic lockout. Longitudinal and transverse level control with automatic on highway levelling system. Range +170 mm/-126 mm. Active suspension control on outrigger control units. Steering Dual circuit, hydraulic power assisted steering with emergency steering pump. Axle lines 1, 2 and 4 steer on highway. Separate electronic hydraulic (steer by wire) steering of the 3rd, and 4th axle line for all wheel steering and crabbing. Brakes Service brake: pneumatic dual circuit disc brakes acting on all wheels, air dryer. Permanent brake: exhaust brake and constant throttle brake. Parking brake: pneumatically operated spring-loaded brake acting on axle lines 2, 3 and 4. Cab 2-mandesign, safety glass, driver seat with pneumatic suspension, engine-independent diesel air heater incl. 24 h timer. Complete instrumentation and driving controls. Air condition. 12 V plug. Two rotating beacons. Fire extinguisher. • 8 tyres, size 445/95 R25 (16.00 R25) - Vehicle width 2,75 m.
• 8 tyres, size 525/80 R25 (20.5 R25) - Vehicle width 2,88 m.